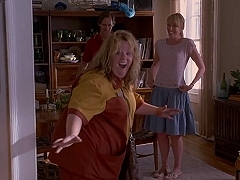 Tammy's (Melissa McCarthy) husband (Nat Faxon) is no big help in a crisis situation because he's still with Missi (Toni Collette). After being fired from her job, Tammy (Melissa McCarthy) finds her husband (Nat Faxon) cheating with their neighbor (Toni Collette) - with lunch. To everyone's surprise, Charlie (Thomas Haden Church) announces his fast engagement and even faster wedding plans. On the road, Charlie (Thomas Haden Church) and Ellie (Toni Collette) give their documentary film a first take. Ellie (Toni Collette) is visited by Lucas (Ryan Egold) in her office, asking about the promised article about his music. Agnes (Toni Collette) loses ist over Hector's (Simon Pegg) careless though of having made the right decision to not move on with her. Hector (Simon Pegg) meets his teenage sweetheart Agnes (Toni Collette) for the first time in years. Ellie (Toni Collette) meets an old friend, Charlie (Thomas Haden Church), who wants to focus his time as a filmmaker. Giles (Oliver Platt) convinces Ellie (Toni Collette) to write an article about her long-lost ex-boyfriend, a rockstar who apparently committed suicide. Martin (Pierce Brosnan), Maureen (Toni Collette), Jess (Imogen Poots) and J.J. (Aaron Paul) discuss how to get away from the press. After Jess (Imogen Poots) was taken away from the party, the group looks out for her at the hospital. 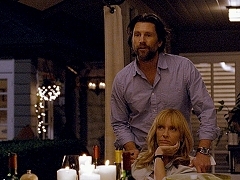 Martin's (Pierce Brosnan) plan to commit suicide is interrupeted by Maureen (Toni Collette). Toni Collette is interviewed on the set of "Hector and the Search for Happiness". Deleted scene from the film, in which Agnes and her husband try to find the secret for a perfect marriage. Toni Collette is interviewed on the set of "Tammy". Scenes from the opening night of "The Realistic Joneses", starring Tracy Letts, Toni Collette, Michael C. Hall and Marisa Tomei. 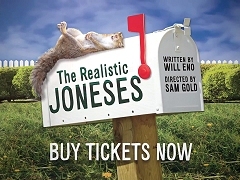 Commercial spot to promote the Broadway premiere of "The Realistic Joneses". Press junket interview with Toni Collette and Pierce Brosnan to promote the theatrical release of "A Long Way Down" in the United States. Promotional interviews with Pierce Brosnan, Toni Collette, Aaron Paul and Imogen Poots, conducted during their stay in Germany for the Berlin Film Festival.